1 The best thing you can do to help keep your furnace running properly is to change your filter every month. The second thing to do is call All Climate Mechanical to service your furnace with a yearly cleaning and inspection. Our technicians follow our 25 point checklist to ensure your furnace is operating safely and efficiently. Combustion efficiency is a measurement of how well the fuel being burned is being utilized in the combustion process. This is different from the efficiency number produced on the analyzer, which is reflective of the total amount of heat available from the fuel minus the losses from the gasses going up the stack. Stack loss is a measure of the heat carried away by dry flue gases and the moisture loss. It is a good indicator of appliance efficiency. The stack temperature is the temperature of the combustion gases (dry and water vapor) leaving the appliance, and reflects the energy that did not transfer from the fuel to the heat exchanger. The lower the stack temperature, the more effective the heat exchanger design or heat transfer and the higher the fuel-to-air/water/steam efficiency is. The combustion efficiency calculation considers both the stack temperature and the net heat and moisture losses. This would include losses from dry gas plus losses from the moisture and losses from the production of CO. The best thing you can do to help keep your furnace running properly is to change your filter every month. The second thing to do is call All Climate Mechanical to service your furnace with a yearly cleaning and inspection. 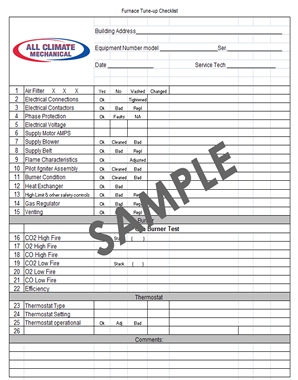 Our technicians follow our 25 point checklist to ensure your furnace is operating safely and efficiently.